The Portuguese round of the World Rally Championship will be heled between May 30th and June 2nd, and it promises lots of emotions for the fans. It will be the first time that the WRC will take place in the memorable Arganil, Góis and Lousã tests. The Ceremonial Start will take place in Coimbra, by the University’s Porta Férrea. The Exponor, in Matosinhos, remains as the Rally’s headquarters, with the administrative checks and scrutineering, the service park and the majority of the starts and arrivals of the WRC’s 7th round of the season. With free entrance, it will be the ideal place for the fans to get in touch with drivers and teams, as well as to see the cars up close. The Vodafone Rally de Portugal will be comprised of 1,463.55 km, 311.59 of which against the clock over a total of 20 stages. May 30th will present the first show with the main drivers driving at least three times through the Baltar circuit, in Paredes, where the Shakedown takes place. This is also the stage for the Rally’s first thrills. Also on Thursday, the Automóvel Club de Portugal’s event returns to the Centre of the country, with Coimbra hosting the Ceremonial Start. On Friday drivers will go to the Lousã, Góis and Arganil stages. Between the two loops fans will have the chance to see the drivers up close at the regroup and tyre fitting area, in downtown Arganil. Once finished the 91.50 km of competition in the Centre, the caravan will drive north for the Rally’s sole Super Special in Lousada. Saturdar starts in Vieira do Minho test, with a renewed start, followed by the well known tests of Cabeceiras de Basto, in the Cabreira mountain, and Amarante, the Rally’s longest stage with 37.60 km starting in Mondim de Basto. The day will end with the double passage over the Gaia Street Stage. Fafe dominates, once again, the last day of competition. Besides the Fafe-Lameirinha stage, with the second passage as the Power Stage, drivers will also face the Montim and Luílhas tests. The Vodafone Rally de Portugal, which is also on the National Rally Championship and the Iberic Peugeot Rally Cup calendars, is sponsored by Vodafone, BP, Hertz and Skoda and counts with the suporto of the Amarante, Arganil, Cabeceiras de Basto, Coimbra, Fafe, Góis, Lousã, Lousada, Matosinhos, Mondim de Basto, Paredes, Vieira do Minho and Vila Nova de Gaia municipalities, as well as the Turismo de Portugal, Turismo do Porto e Norte e do Turismo do Centro. Click here to see the 2019 Vodafone Rally de Portugal's programme. 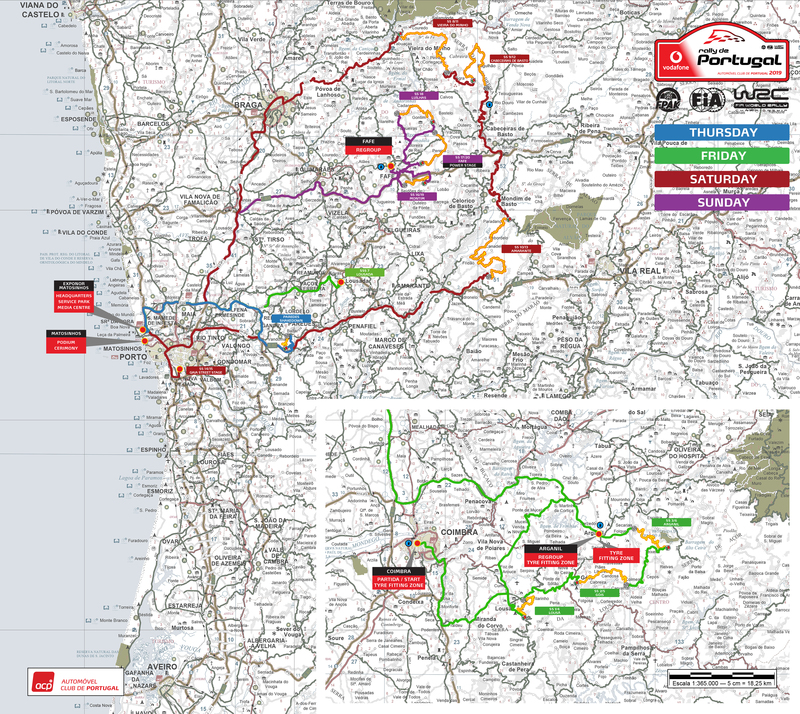 Click here to download the Vodafone Rally de Portugal map in Hi-rez.